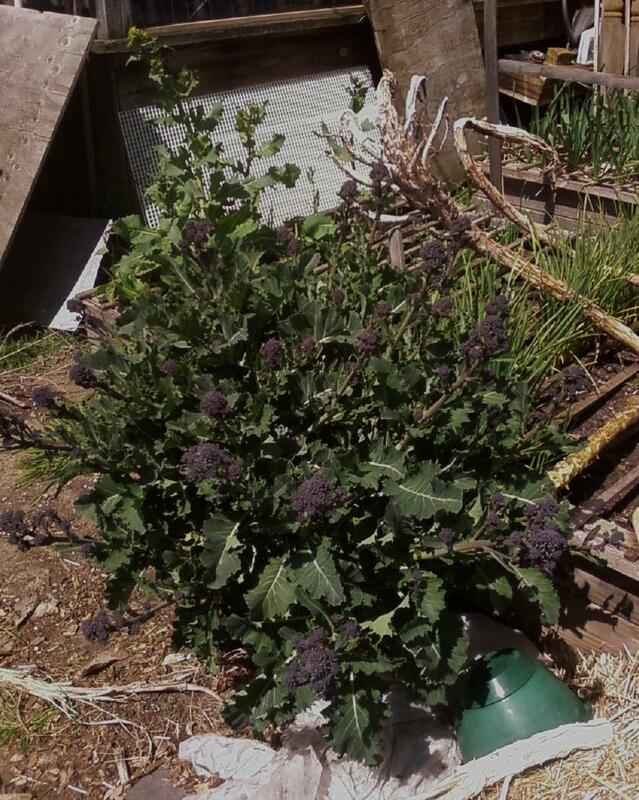 Mog Cottage Urban Farm: It's Spring and the Purple Sprouting Broccoli is Back! It's Spring and the Purple Sprouting Broccoli is Back! As you know, it's been a while since I've posted anything. With horticulture classes starting up again for winter quarter, and the bleak, cold weather to boot, it's been nearly impossible to find the time or get motivated. I've been a total couch potato, stuck to the sofa with the laptop glued to my thighs doing homework or playing computer solitaire. A grim existence. Veg. Gardening has been far from my mind and the garden looks it. With all of the crappy, cold weather we've had in PNW world this winter, you'd think nothing edible from last season would've survived. I planted the garlic, onions and fava beans last fall, and they have started to show their greens through the straw as expected. 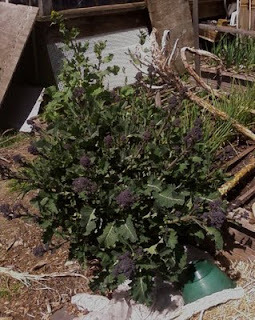 But, the Purple Sprouting Broccoli that was so enormous, looked pretty done-in from the big freeze this winter. It was all leaves and no florets last summer and I was hoping it would winter over better than it did. All the leaves drooped and most of the large stalks turned mushy and became these tree-like snags sticking up or flopping over in the bed. But recently, I've become an optimist (yeah, that's what I said) because when I went to take stalk of the beds to see what prep work needs to be done., low and behold, some of the broccoli has resurrected! Just in time for Easter. A sign from God! OK, maybe not, but I am bursting forth with Purple Sprouting broccoli florets at this very moment. 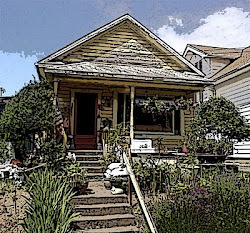 In fact, if one of the plants wasn't flopped over like a ground cover, it could be trained as a standard topiary tree, like what is done to roses. Hmmm, maybe I should try and stake it up. I'll let you know, if I succeed. The others are sending out new shoots all along the barren stems. I should have a bumper crop of PS broccoli this spring. Yay. . . .Crap! There's a white cabbage moth fluttering about.